And another case hits the home page of VroniPlag. Case 21 is another dissertation from the TU Berlin with the same doctoral advisor as Jürgen Goldschmidt. There are copies of the Wikipedia from around 2004, copies of texts about earthquakes in Switzerland that have Iraq switched in, and copies from textbooks. And there seems to be more rolling in by the minute. The Leipziger Volkszeitung reports that the University of Halle doctoral thesis committee is unanimously recommending to the faculty board that the doctorate of Siegfried Haller be rescinded. 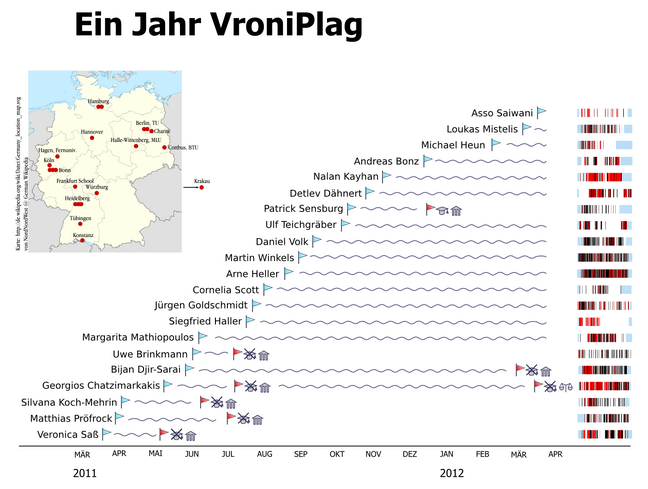 VroniPlag documented significant plagiarism on over 20% of the pages. Three quarters of these pages were more than three quarters plagiarized. The thesis on the restoration of living quarters in a town plagiarized heavily from documents published by the city authority responsible for the restoration. Haller worked for the city authority and is said to have been co-author of much of the documentation. However, no authorship is listed for the documents, and the thesis does not mention using them. The faculty board meets on April 18 to decide. There has been some criticism about a local newspaper reporting on the state of internal affairs of the university before the university reaches its final decision. This evening it was announced that the University of Cologne has rescinded the doctorate of a member of the Bundestag, Bijan Djir-Sarai, nine months after the documentation was published on VroniPlag. Dijr-Sarai has stated that he will not be pursuing the matter legally, as some of the other people with rescinded doctorates are doing.